Bohemians kick off their league campaign with the second of three early-season meetings with UCD – and boss Aaron Callaghan wants the Gypsies to start as they mean to go on. Callaghan is keen to make a winning start on Friday (Dalymount, kick-off 7.45pm) and is confident that his squad is much better prepared than at the same time last year. “We have been able to put a bit of shape and structure on the team but we will see better when we have played a few league games,” Callaghan said. Callaghan firmly believes his squad can improve on last season. The manager is not fazed by last month’s extra-time defeat to UCD in the Leinster Senior Cup. Callaghan expects his counterpart Martin Russell to make “five or six” changes for Friday and he himself could be making as many EIGHT changes. The manager is delighted to have retained 15 of last year’s squad, as the slow start in 2012 was at least partly down to players learning new approaches. Callaghan also believes he has a squad with cover for all positions, and thus competition for starting places. However, he already has a fairly clear idea what his best 11 might look like but “nobody can rest on their laurels, they need to keep their standards high”. The pre-season schedule has taken a small toll on the players. Shane Fitzgerald (ankle), Kevin Devaney (ankle) and Kevin O’Leary (illness) are not available for Friday. On Monday 11th March, Bohemians again host UCD at Dalymount Park in the EA Sports Cup (kick-off 7.45pm). A poster advertising the Hat-trick Sponsorship Initiative is now available to download below. 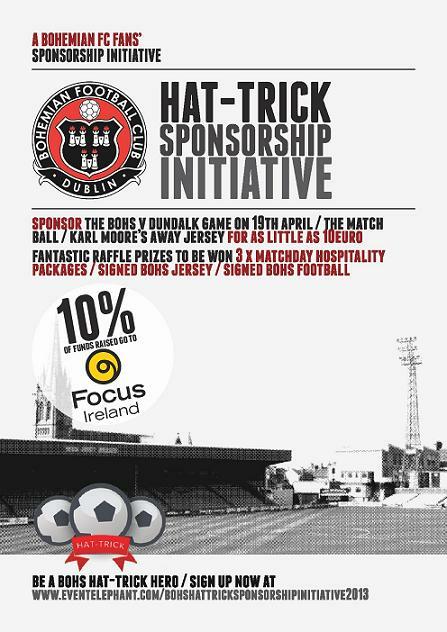 The 2013 Hat-trick Sponsorship Initiative is a unique fans’ fundraiser, the aim of which is for Bohemians supporters to collectively sponsor a Bohs match, matchball and player – the three goals!  While such sponsorship would be outside the means of many of us individually, collectively it can become a reality when we join together. When you have goals, you also have an ‘assist’ – the HSI assist will be our designated charity Focus Ireland, who do fantastic work to break the cycle of homelessness. No matter what challenges Bohemian FC are facing, we cannot lose sight of those less fortunate than ourselves. Focus Ireland will receive 10% of the funds raised, will get a free advert in the Bohemians matchday programme and will do a bucket collection at the HSI-sponsored match. That match will be Bohs v Dundalk on April 19th and the matchball will also be sponsored by the HSI. The player jersey being sponsored by the HSI this season is Karl Moore’s away jersey. The hospitality packages include tickets to the Bohs v Dundalk game, match programmes, seats in the Directors’ Box and half-time hospitality in the newly-refurbished Jackie Jameson Bar. Don’t miss out! Be a Bohs Hat-trick Hero and sign up now here. 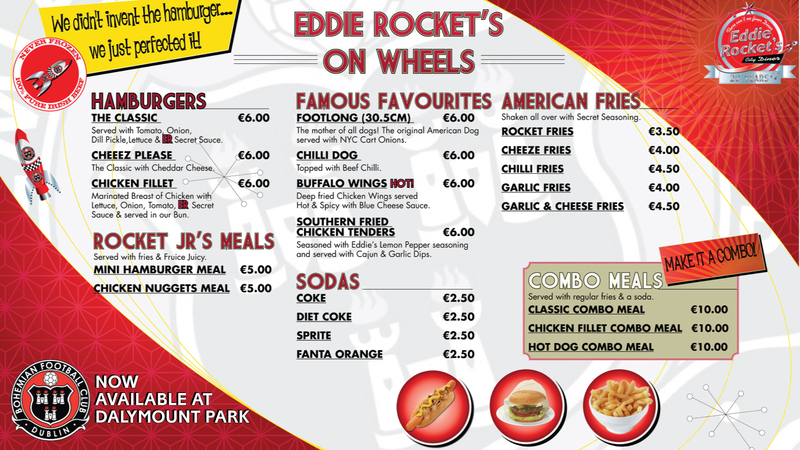 EDDIE ROCKET’S are Bohemians’ new matchday catering partners for the 2013 season. Check out their menu for what’s on offer at Dalymount Park this term, starting with the Airtricity League opener this Friday (March 8th, 7.45pm) against UCD. Kids meals – a mini hamburger or chicken nuggets served with fries and Fruice Juicy – cost just €5! Bohemian FC is delighted to announce that it has agreed a training sponsorship deal with IT Blanchardstown for the coming Airtricity League season, writes BRIAN TRENCH. Under the deal ITB will provide subsidised training facilities, including its new FIFA 1 Star all-weather pitch. The all-weather pitch has been open for six months. It was part-funded by Fingal County Council and has also been made available to local sports clubs. Bohemian FC will also take advantage of the Sports Management and Coaching Degree students and staff in the Institute who will provide fitness support to the senior and under 19 teams. ITB will receive pitchside and match-programme advertising and the ITB logo is displayed on this season’s new home and away team kit. Bohemian FC president Matt Devaney said the club was delighted to form this new relationship with IT Blanchardstown. “We have already benefited from the use of the Institute’s excellent facilities in our pre-season preparations. We were able to host several friendlies on the all-weather pitch there when Dalymount Park could not be used without great risk to the playing surface,” Mr Devaney said. “Under the partnership with ITB our senior and under-19 teams will continue to train there and I’m sure they will draw strength from the quality of the facilities and the support of the Institute staff,” he continued. View more pics of the launch on our Facebook page! Player sponsorships for the 2013 season are available to purchase from the Bohs Store online. Home jersey sponsorship costs €300, while away jersey sponsorship is €250. Home and away sponsorship of the same player is available for just €450. Sponsors will get their name/company name under their player’s profile picture in the matchday programme and website and will also be presented with their player’s signed match-worn jersey at the end of the season. To see which players remain available for sponsorship, please visit the Bohs Store. Alternatively, email commercial@bohemians.ie or call 086-1636640. Deadline for entries for the Bohemians LOI-LMS is THIS TUESDAY (March 5th). Click here to enter for just €10. The Bohemians Last Man Standing competition is BACK for 2013. We will be using the League of Ireland Premier and First division fixtures, starting with the opening-day fixtures this Friday (March 8th). The Last Man Standing competitions have raised over €20,000 for Bohemians in the last three season and the same amount has been given out in prize money. These competitions have raised vital funds for the club and we aim to continue our efforts to support Bohs on and off the pitch. We encourage all true Gypsies to enter the competition and to recruit friends and family members to join in. For this series, the entry fee is just €10. It’s easy to take part and there’s fun and excitement in the competition, as well as the satisfaction of knowing that half of all the entry fees goes to Bohemian Football Club. There’s also potentially a massive prize for the winner of the competition. To play, you pick a team from the League of Ireland in week one. If they win you go through to next round where you pick another team (you cannot pick the same team twice). If your team loses or draws you are out. Simple as that. If you join the competition you get an email notice ahead of each round of fixtures with a deadline to reply with your selection. This continues until we have a Last Man Standing (or woman, as we have had more than one female winner! ), who picks up the prize money. If more than one person is still standing after 10 matches, then they will share the pot of all entry fees received. Dalymount will be hosting a new open-mic night once a month – starting next Saturday at 8pm (March 9th). Admission is free and the night will start with an open mic. Anyone is free to play, just bring your instrument, loosen your vocal chords at the bar and stick your name on the list. Hypno Puppets: Visit Facebook site, visit YouTube site, visit SoundCloud site. Other acts to be announced in coming days. If you are interested in playing or singing on the night DalymountSessions@bohemians.ie.